-- Select a Size -- 5/8" x 4' Length 1" x 6' Length - Out of Stock! 5/8" x 6' Length - Out of Stock! Searching for a classic nylon dog leash in a vibrant blue? 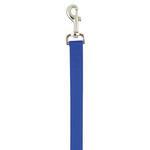 Look no further than our Zack & Zoey Nylon Dog Leash in Nautical Blue! Add some durability and classic style to your walks with our Zack & Zoey Nautical Blue Nylon Leash. This blue nylon leash will be a staple for any dog or cat's walking wardrobe. Each leash features a nickel-plated swivel clip for a quick and secure attachment. The nautical blue color will go with anything and is a great choice for patriotic events. This leash is perfect for supporting your favorite sports teams that feature royal blue such as the Detroit Lions or the Kansas City Royals. 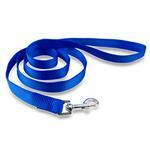 You will love the classic design of this nylon dog leash in blue. Available in multiple colors. Matching couplers, collars, and dog harnesses are available too. Zack and Zoey Nylon Dog Leash - Nautical Blue Customer Photos - Send us your photo! I love these leashes! I have a few in different colours Perfect! This is Jasper and his neighbour friend Buddy, the Corgi! They have a love-hate relationship lol..
Nate loved his visit to florida, and walks on the beach! Posted On 12/02/16 by Joyce J from Sarasota, FL Yes, Joyce J recommends this product! I have several colors in this same leash, it sells for less on Baxter Boo than in the pet stores. This leash is nice, but it just was not what I needed. I ended up returning it. It was too short and a little too bulky for my pup. Posted On 05/10/16 by Stephanie R from Monroe, NY Yes, Stephanie R recommends this product! We love the Nylon Nautical blue leash by Zack & Zoey. We also ordered the matching harness. It is very durable and lightweight and the color just pops! Posted On 06/23/15 by Judith E from Tacoma, WA Yes, Judith E recommends this product! The right color to match my dog's current harness and collar. Sturdy leash with a solid clasp. The nice bright colors match the collars. Very nice leash. It matches my new harnesses great! I love Baxter Boo. Posted On 03/21/15 by bonnie s from , NY Yes, bonnie s recommends this product! This is a great and very durable leash. Its so hard to find in a 4' leash and it comes in great colors. We love the colors available in this Zach and Zoey leash (and matching collars). Ultra violet, bluebird, nautical blue, parrot green---just the color names made us want to get these! I have two large dogs and a cat and because I live in a big city it's hard to find high quality pet gear for affordable prices. When I placed my order I was already satisfied but the extra 25% off at checkout was definitely a bonus. When I received the order all of the items were EXACTLY what I was expecting which says a lot because I am VERY particular (especially about my babies). I'll end it by saying this before I go on too much longer; the handwritten thank you note that came with the package was the icing on the cake. It was minor but made a huge impact making me feel like I was dealing with real people and not some huge corporation. This is THE ONLY PLACE for pet supplies!!!! Thanks Baxterboo! !